One can also remove the recipient to a Thru email after delivery. 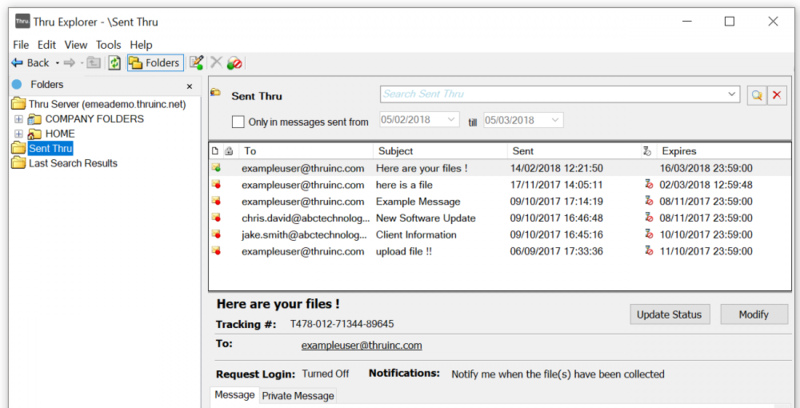 If you remove a recipient from the Thru email, however, they will be prohibited from downloading any further. If they have already downloaded their files they just will not be able to download them again. 1. Navigate to the Sent Thru folder within Thru Explorer. 2. Click the Thru email you wish to edit, and then click Modify. 3. Right-click on the email address you wish to remove, and select Remove from the drop-down menu. You can only remove recipients if you have more than one recipient to whom you have already sent mail. Note: Once the email has been sent, you cannot add more recipients to it; they can only be removed. If you wish to add other recipients, you must create a new Thru Email.